We are a premier dog daycare serving Indianapolis IN and provide a fun, engaging environment with close to 10,000 square feet of play space! Day Care has been a great way for our furry guests to enjoy all the excitement and benefits that Paws & Play has to offer. It’s been a program that has provided families the peace of mind knowing their dog is being cared for in a safe and fun environment for the day, regardless of their dog’s social requirements. The industry standard for Day Care has been allowing dogs the option of group play or a one-on-one setting. While this model has proven to be a wonderful option for some dogs, it doesn’t fit the needs of all dogs. We at Paws & Play are about to change that! The People Dog: These dogs do not enjoy the company of other dogs. They may even try to start some trouble if they come in too close of contact with other dogs. They fulfill their pack needs with humans. And they usually LOVE humans. The Wallflower: These dogs don’t mind other dogs but, would prefer not to be in a crowd with them. A lot of these dogs end up in group settings simply because they tolerate the group. They usually hang out by themselves or choose a corner of the play space to make camp in. They’re not there to make trouble but they’re not really having a great time. The High Drive Dog: Throw the ball! Throw the ball! No one else in this group matters but that ball is life! These dogs may even be protective of their ball or toy and not appreciate others getting involved in their game. A high drive dog may also turn their group play setting into a game or a challenge. These guys can cause trouble without meaning too. The Every-Dog-is-My-Friend Dog: These dogs are very social within their own species. They love every dog they meet and share their space and toys well. Their preferred energy outlet is romping around with their friends. They listen to other dog’s social cues and have strong cues of their own. The I'm Working on Myself Dog: As a training facility, we see many dogs that are under socialized with people and other dogs. These dogs are working on themselves by learning how to control impulse, emotions, or even learn doggie social cues. The Lounger: These dogs prefer to lounge in the comfort of their room and watch the activities of the day happen. Getting out to potty and stretch their legs is all the activity they’re looking for. We could talk about canine sociability for hours. But, we’ll leave all those details for a lesson with one of our trainers. Just like people, every dog has a unique personality. Those listed above are the most common types that we see. And, as you can see, the current two options for the Day Care program don’t fit all these personality types. Which means that the dogs aren’t always getting the full benefit out of the program. Some of these dogs need mental stimulation like training, sports, tricks, games, puzzles, etc. to really feel worn out. Others need less social interaction to feel comfortable and fulfilled at the end of the day. Our Day Care program will now contain three options that help satisfy all dogs’ needs. Excusion: A day of play, training, and walks. This Day Care program starts with a morning warm up consisting of leash/treadmill walks and rest times. Mid-day entails multiple sessions of one-on-one play or snuggle time and a session of a fun activity. Activities will range from learning new tricks to puzzle games to agility equipment. The late afternoon will be a cool down period with controlled activities like leash walks and massages. Getaway: A day of relaxation, toys, and walks. Each dog will enjoy relaxing time in their own room complete with music, bedding, and an interactive toy. Potty breaks are provided throughout the day along with a mid-day leash walk to sniff, play, and snuggle. Group Play: A full or half days’ worth of access to our group play spaces. A day filled with friends, toys, and play. Each dog will be individually assessed and, our educated and experienced team will recommend which Day Care programs your dog would enjoy and benefit from most. We’re excited to introduce Day Care 2.0 and watch how these new programs will help better benefit and fulfill the lives of our guests and their families. If you are interested in learning more about these programs or which programs your dog would enjoy, feel free to contact us at (317)776-7824 or email us at info@pawsandplaydogresort.com. Packages are available for all Day Care types. Full day Day Care is available from open to close. Half day Day Care is available same day for up to six hours in the facility. Multiple dog families can enjoy a 25% discount for any additional pets. Day Care packages are available. Dogs must be up to date on their rabies, distemper, and bordetella vaccinations, good with other dogs, and have a clean bill of health to be qualified for group play. Males over the age of 6 months that are not neutered are not eligible for group play. Lots of Love & Fun! Paws & Play has been implementing industry standards set by The Dog Gurus, a highly respected organization, for over a decade and worked diligently to not only meet these standards, but to exceed them! The pet care industry has observed that dogs need a healthy balance of physical exercise, mental activities, and true rest periods. According to Susan Briggs, “Dogs may take natural rest breaks during playgroups, but it is the rare dog that will relax and enter a deep sleep. Most dogs napping in the playgroup are in light sleep, but very alert so they can jump up whenever something exciting happens. They do not reach the restful sleep stages needed to keep their brain healthy. Nineteenth century sleep deprivation studies performed on dogs confirmed degenerative changes in their brains resulted from lack of rest.” Susan Briggs, one of the two pioneers for the first ever dog day care center over 20 years ago, has worked with industry professionals (known in our industry as The Dog Gurus) to create standards of conduct to promote safety and fun in group play environments. Our top priorities for the guests in our care are equal parts fun and overall well-being, with a heavy emphasis on cleanliness and safety! Briggs suggests, “Providing a private, quiet area for rest periods allow dogs to reach the restful deep sleep levels they need to stay healthy and happy.” For our guest’s rest periods, they are provided with their own individual upgraded room with fresh water and a raised bed for comfort. Once they have been given the opportunity for an adequate break based off their individual needs, they will be given the chance to join their friends for another round of play! We recognize not all facilities are the same, so we urge all humans to seek out a facility that not only meets their needs but also follows a code of conduct that holds them accountable to meet the current industry standards. Briggs reminds us, “exhaustion is not the measure of success” and although physical exercise is a huge benefit for relieving your dog’s energy, “we also consider it important to provide mental stimulation, which allows your dog to think and use his brain during the day. Mental work is tiring for your dog while building their confidence and self-control.” Paws & Play has several unique programs that were designed with this balance in mind. We invite you to take a tour at any time during our regular business hours to see if Paws & Play is the right fit for you! With close to 10,000 square feet of play space, our indoor and outdoor play spaces are designed with fun in mind! Our outdoor play yards feature XGrass Canine Turf, an artificial turf designed specifically for dogs that allows our guests to enjoy the feeling and benefits of grass without the mess. They also include shade sails, doggie play ground equipment, pools, and toys. 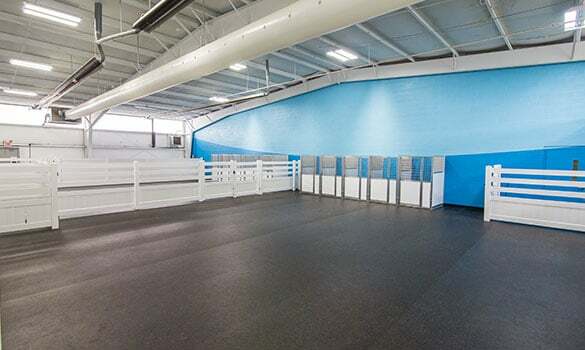 Our indoor play spaces include padded flooring, toys, and resting areas. All of our indoor and outdoor play spaces are separated for size. Our small dog groups and our larger dog groups play in different areas to make play as stress free as possible! Is it your dog's birthday? Let us know! We love celebrating birthday parties during Day Care. We even provide the hats. If you are interested in hosting a Birthday Party that involves your personal friends, family, and their dogs, please contact us for more information on rental prices and packages.